Take a personnel from your discard pile and place him or her on your headquarters mission where he or she could be played. At the end of this turn, remove that personnel from the game. Destroy this event. "If we can regenerate his pathways with his own neuron cells, we might be able to revive him." 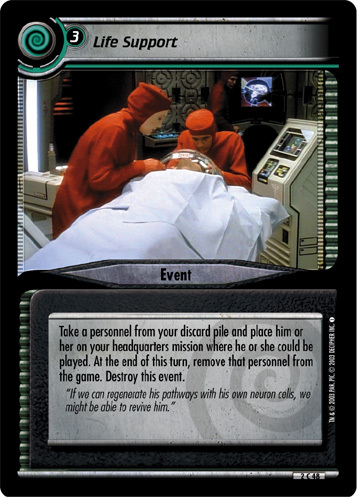 Characteristics: "relocate" personnel cards - form discard pile into play, recover cards from your discard pile, remove cards from the game (other cards). There are 14 entries for Life Support (ST2E 2 C 48) at the Tradeplace (28 haves and 4 wants). Click here to see all trade list entries for this Common card!